Summary: A hacker forces a teenage girl to do some drastic things in exchange for some "too rude for Instagram" like pictures. Well, this was a step up from Emily Osment's Lifetime movie that made everyone sob in their homes a couple years ago. 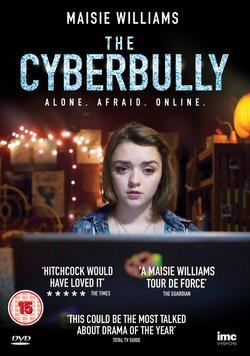 This film was something else, like a mixture of Phone Booth, Unfriended and a Lifetime movie and it was one of the best shorts I've seen in a while and this is mainly because of the lead, Maisie Williams, who is literally on screen for more than 98% of the movie. She shines as just your average teenager who gets put in this fucked up situation and the best part is that she is so genuine with every damn facial movement and that she is so relatable and even though she isn't in the most relatable situation, her role feels real and for that, I was left completely and utterly impressed. Because it was a thriller, it took the issue of cyberbullying in a sort-of unsuspected way. I started it and was completely sucked in by everything that was going on. Who was hacking Casey? Was she the bully or who had she hurt? Why exactly were they doing this? All these questions were running through my head and after it was over and I'd gotten the answers, I was still shell shocked over the fact that while kids aren't being threatened by hackers everyday, they are being bullied over the Internet by strangers every single day and then there are the people who do the posting who say things horrible things on the Internet every single day and its a huge cycle. Over and over again and it's unbroken because when we get on the Internet and post things, we become faceless, we become these avatars only known to anyone by a username and a picture. But the question remains, who are we really talking to? The social message is really what, as a viewer, we're left with. Not the plot, not the characters or what happened at the end. We're left with the fact that this really happens and that's it. We don't know what happens after the film ends, not with the hacker or our lead and even though that's a bit unfufilling, the message is loud and clear and it keeps us watching until the very last minute.